Lightly spiced freshly shredded potatoes are wrapped around cubes of your favorite creamy cheese before being fried to golden brown tater tot perfection. Sometimes it’s ok, you know this whole growing up thing and with these hearty chunks of fried potato it’s clear that one of our childhood favorites was ready to grow up too. 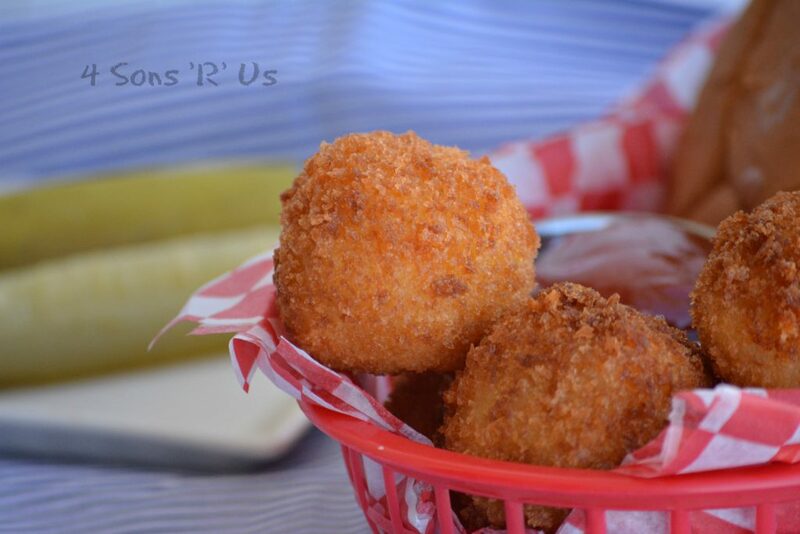 These Giant Cheesy Tater Tots are calling your name. Earlier this week we brought you a fun, crowd-sized take on the much loved bacon cheeseburger. 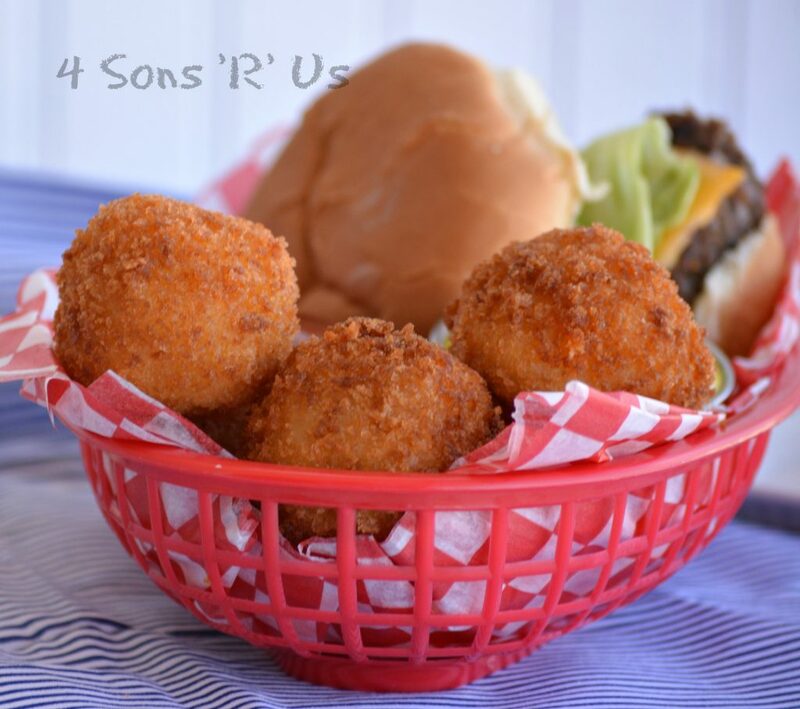 Today we’re back with an equally yummy twist on our favorite side to serve with our burgers– tater tots. 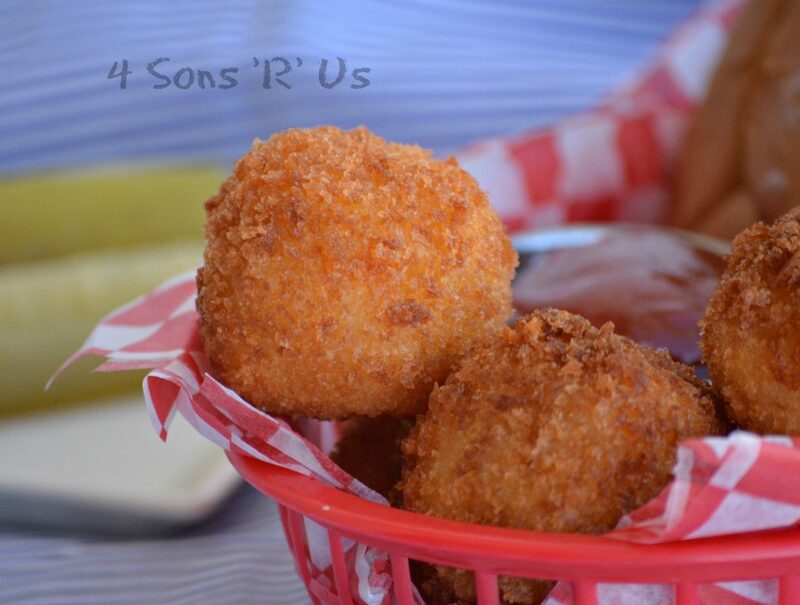 And not any regular tater-tot either, gigantic, cheese filled balls of fried heaven. Seriously, how can you go wrong with this classic meat and potato pairing? Baked potatoes, french fries. potato wedges, tater tots– in almost any incarnation they go together with burgers like a hand in a glove. I see one, i expect to see the other; I’m also a firm believer in the cheese can make anything better theory. Whether it’s a plain old grilled beef patty or any incarnation of the potato. Instead of dipping or drizzling these bad boys in cheese sauce, we’ve taken our case straight to the heart of the matter. Pull apart one of these beautifully fried potato balls and be prepared for a not-so surprise inside, but one that’s still beautiful to behold. With each bite you’ll find yourself humming with satisfaction as you enjoy the way the crisp potato blends with the melted cheese waiting to surprise you inside. 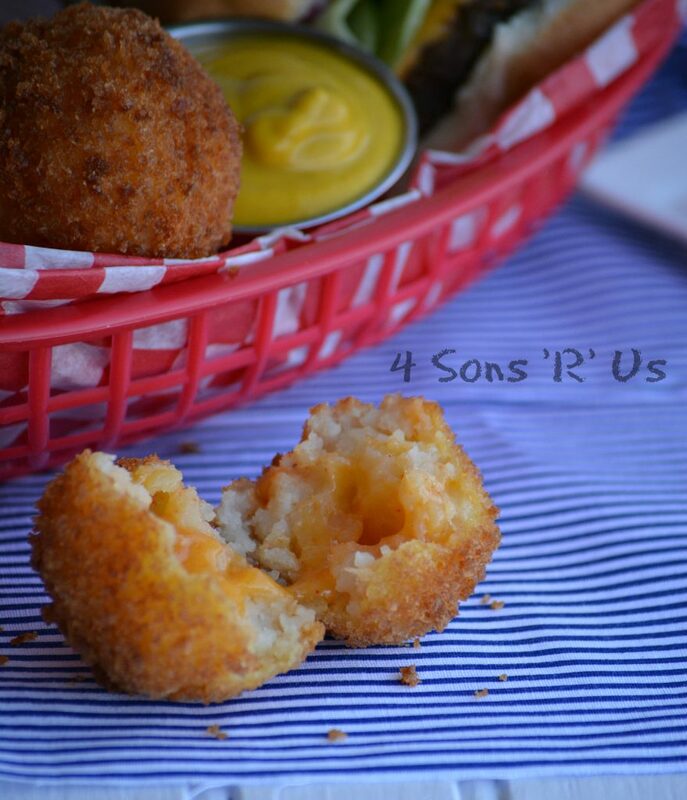 King-sized tater tots made of freshly shredded baking potatoes are stuffed with your favorite cheese. Preheat the canola oil in a deep fryer to 375 degrees or heat it in a pot over medium-medium high heat until a thermometer reads the temp. Peel the potatoes and put them in large pot and add water until it's 1-2 inches above the potatoes. Bring the water to a rolling boil, turn the heat down to a high simmer and then let the cook thirty minutes, or until cooked/tender but not mushy. Transfer the potatoes to a strainer and immediately run them under cold water to stop them from cooking. Set them aside to completely cool. Use the shredding attachment in your food processor shred the potatoes like hash browns. Transfer the shredded spuds to a large bowl and gently toss to stir in the spices and cheese until well combined. Scoop about 1/4 cup of the spiced spuds out and use your hands to pack them into spheres. In 3 separate bowls put one of the following in each: flour, eggs, and breadcrumbs. To coat the tots start by rolling them in flour, then into the eggs, and finally into the breadcrumbs making sure to cover them completely. Place the coated tater tot onto a baking sheet, repeating until all the tater tots are done. Working in batches of 4-5 tots at a time, fry them until golden. Use a slotted spoon to remove them from the oil, and transfer them to a paper towel lined plate to drain the excess grease off. Sprinkle with a pinch of sea salt or seasoning salt, if desired, and serve warm. If you enjoy a little work ahead of time for convenience come meal time-- there are perfect for freezer cooking. Place the shaped, uncoated tater tot balls on a baking sheet and place them in the freezer for a few hours, or until frozen. Transfer them to a ziploc bag and store in the freezer until ready to use. To cook, remove them from the freezer and begin at step 7. Thanks for the love, Linda! These tater tots look delicious! Homemade is always best, and I’m sure that this is another great example of that. These look so appetizing! Yum! They are good, but take forever!!! !